Microsoft does not currently recommend, and does not support, automation of Microsoft Office applications from any unattended, non-interactive client application or component … because Office may exhibit unstable behavior and/or deadlock when Office is run in this environment. These days, Office files are no longer in a proprietary binary format, and are we can create the files directly without using COM automation. A .docx Word file, for example, is a collection of XML documents zipped into a single file. The official name of the format is Open XML. 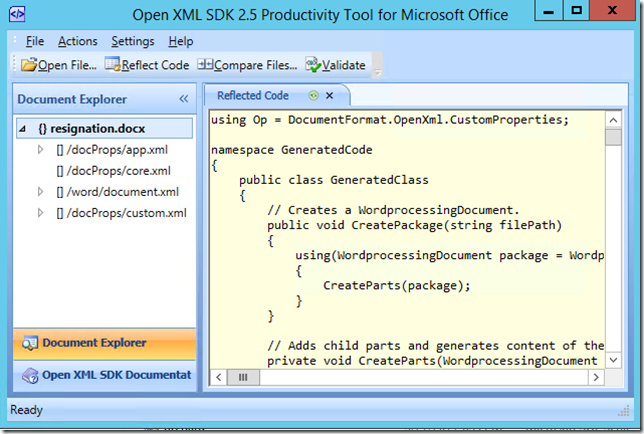 There is an SDK to help with reading and writing OpenXML, and a Productivity Tool that can generate C# code for a given file. All you need to do is load a document, presentation, or workbook into the tool and press the “Reflect Code” button. The downside to this tool is that even a simple document will generate 4,000 lines of code. Another downside is that the generated code assumes it will write directly to the file system, however it is easy to pass in an abstract Stream object instead. So while this code isn’t perfect, the code does produce valid document and is useful for figuring out how the SDK classes work together. It’s also not difficult to rework the logic so the class functions as a “view”. You can pass in a model object and have the code dynamically generate a document by replacing hard coded content inside with data from the model. I've used ClosedXML to create spreadsheets and I found it much easier than the raw OpenXML SDK, which I think it's too low level for most needs. For those using PHP, the MSDoc Generator class: http://www.phpclasses.org/package/2631-PHP-Create-Microsoft-Word-document-without-COM-objects.html is quite dated, but is easy to use, can generate .DOCX & legacy .DOC, and still works well today. For working with Word documents, check out DocX, available via Nuget. DocX provides the higher-level abstraction over OpenXml that Doeke is suggesting. For working with Excel documents, LinqToExcel is wonderful, but takes a dependency on ACE. ExcelDataReader is a little more limited in scope, but has no such requirement (if I recall, this one also is an abstraction on OpenXml, though I could be wrong. All are available via Nuget. For Excel I have been uisng NPOI, which support OpenXML. It is a port POI and I would say c. compatible syntax, so there are many examples that you can review in the Java implementation that can help. For in depth .Net tutorials, you can read the excellent blog post here: http://www.leniel.net/2009/10/npoi-with-excel-table-and-dynamic-chart.html. NPOI is a very nice abstraction over the OpenXML library as well. The downside is that it's supported by just one guy. NPOI also claims to support Word docs, but I haven't had direct experience with the tool. I want to upload the excel 2010 files and read the content and save it to sql server. After uploading , I don't want to save the file in server. How to achive this?